The Triumph Motor Company was a British car and motor manufacturing company. The Triumph marque (trade-name) is owned currently by BMW. The marque had its origins in 1885 when Siegfried Bettmann (1863–1951) of Nuremberg formed S. Bettmann & Co and started importing bicycles from Europe and selling them under his own trade name in London. The trade name became "Triumph" the following year, and in 1887 Bettmann was joined by a partner, Moritz (Maurice) Schulte, also from Germany. In 1889 the businessmen started producing their own bicycles in Coventry, England. The company was renamed the Triumph Cycle Co. Ltd. in 1897. In 1902 they began producing Triumph motorcycles at their works in Coventry on Much Park Street. At first, these used engines purchased from another company, but the business prospered and they soon started making their own engines. In 1907 they purchased the premises of a spinning mill on Priory Street to develop a new factory. Major orders for the 550 cc Model H were placed by the British Army during the First World War; by 1918 Triumph had become Britain's largest manufacturer of motorcycles. In 1921 Bettmann was persuaded by his general manager Claude Holbrook (1886–1979), who had joined the company in 1919, to acquire the assets and Clay Lane premises of the Dawson Car Company and start producing a car and 1.4-litre engine type named the Triumph 10/20 designed for them by Lea-Francis, to whom they paid a royalty for every car sold. Production of this car and its immediate successors was moderate, but this changed with the introduction in 1927 of the Triumph Super 7, which sold in large numbers until 1934. In 1930 the company's name was changed to Triumph Motor Company. Holbrook realized he could not compete with the larger car companies for the mass market, so he decided to produce expensive cars, and introduced the models Southern Cross and Gloria. At first these used engines made by Triumph but designed by Coventry Climax, but in 1937 Triumph started to produce engines to their own designs by Donald Healey, who had become the company’s Experimental Manager in 1934. The company encountered financial problems however, and in 1936 the Triumph bicycle and motorcycle businesses were sold, the latter to Jack Sangster of Ariel to become Triumph Engineering Co Ltd. Healey purchased an Alfa Romeo 8C 2300 and developed a new car model with an Alfa inspired straight-8 engine type named the Triumph Dolomite. Three of these cars were made in 1934, one of which was used in competition and destroyed in an accident. The Dolomites manufactured from 1937 to 1940 were unrelated to these prototypes. In July 1939 the Triumph Motor Company went into receivership and the factory, equipment and goodwill were offered for sale. Thos W Ward. purchased the company and placed Healey in charge as general manager, but the effects of the Second World War again stopped the production of cars; the Holbrook Lane works were completely destroyed by bombing in 1940. In November 1944 what was left of the Triumph Motor Company and the Triumph trade name were bought by the Standard Motor Company and a subsidiary "Triumph Motor Company (1945) Limited" was formed with production transferred to Standard's factory at Canley, on the outskirts of Coventry. Triumph's new owners had been supplying engines to Jaguar and its predecessor company since 1938. After an argument between Standard-Triumph Managing Director, Sir John Black, and William Lyons, the creator and owner of Jaguar, Black's objective in acquiring the rights to the name and the remnants of the bankrupt Triumph business was to build a car to compete with the soon to be launched post-war Jaguars. The pre-war Triumph models were not revived and in 1946 a new range of Triumphs was announced, starting with the Triumph Roadster. The Roadster had an aluminium body because steel was in short supply and surplus aluminium from aircraft production was plentiful. The same engine was used for the 1800 Town and Country saloon, later named the Triumph Renown, which was notable for the styling chosen by Standard-Triumph's managing director Sir John Black. 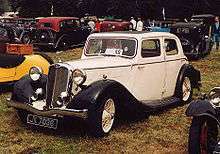 A similar style was also used for the subsequent Triumph Mayflower light saloon. All three of these models prominently sported the "globe" badge that had been used on pre-war models. When Sir John was forced to retire from the company this range of cars was discontinued without being replaced directly, sheet aluminium having by now become a prohibitively expensive alternative to sheet steel for most auto-industry purposes. In the early 1950s it was decided to use the Triumph name for sporting cars and the Standard name for saloons and in 1953 the Triumph TR2 was initiated, the first of the TR series of sports cars that were produced until 1981. Curiously, the TR2 had a Standard badge on its front and the Triumph globe on its hubcaps. Standard had been making a range of small saloons named the Standard Eight and Ten, and had been working on their replacements. 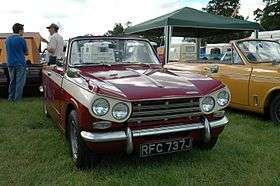 The success of the TR range meant that Triumph was considered a more marketable name than Standard, and the new car was introduced in 1959 as the Triumph Herald. 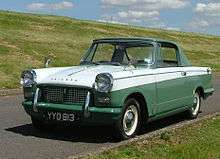 The last Standard car to be made in the UK was replaced in 1963 by the Triumph 2000. Standard-Triumph was bought by Leyland Motors Ltd. in December 1960; Donald Stokes became chairman of the Standard-Triumph division in 1963. Further mergers resulted in the formation of British Leyland Motor Corporation in 1968. Triumph set up an assembly facility in Speke, Liverpool in 1959 gradually increasing the size of the most modern factory of the company to the point that it could fully produce 100,000 cars per year. However, only a maximum of 30,000 cars was ever produced as the plant was never put to full production use, being used largely as an assembly plant. During the 1960s and '70s Triumph sold a succession of Michelotti-styled saloons and sports cars, including the advanced Dolomite Sprint, which, in 1973, already had a 16-valve four-cylinder engine. It is alleged that many Triumphs of this era were unreliable, especially the 2.5 PI (petrol injection) with its fuel injection problems. In Australia, the summer heat caused petrol in the electric fuel pump to vapourise, resulting in frequent malfunctions. Although the injection system had proven itself in international competition, it lacked altitude compensation to adjust the fuel mixture at altitudes greater than 3,000 feet (910 m) above sea level. The Lucas system proved unpopular: Lucas did not want to develop it further, and Standard-Triumph dealers were reluctant to attend the associated factory and field-based training courses. For most of its time under Leyland or BL ownership the Triumph marque belonged in the Specialist Division of the company which went by the names of Rover Triumph and later Jaguar Rover Triumph, except for a brief period during the mid-1970s when all BL's car marques or brands were grouped together under the name of Leyland Cars. The last Triumph model was the Acclaim, introduced in 1981 and essentially a rebadged Honda Ballade built under licence from the Japanese company Honda, at the former Morris Motors works in Cowley, Oxford. The Triumph name disappeared in 1984, when the Acclaim was replaced by the Rover 200, a rebadged version of Honda's next generation Civic/Ballade model. 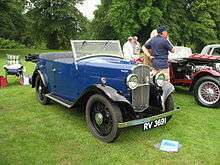 The BL car division was by then named Austin Rover Group, which also ended the Morris marque as well as Triumph. 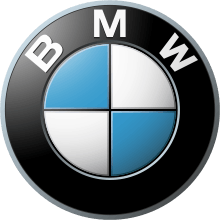 The trademark is owned currently by BMW, which acquired Triumph when it bought the Rover Group in 1994. When it sold Rover, it kept the Triumph marque. The Phoenix Consortium, which bought Rover, tried to buy the Triumph brand, but BMW refused, saying that if Phoenix insisted, it would break the deal. The Standard marque was transferred to British Motor Heritage Limited. The Standard marque is still retained by British Motor Heritage who also have the licence to use the Triumph marque in relation to the sale of spares and service of the existing 'park' of Triumph cars. The Triumph name has been retained by BMW along with Riley, and Mini. In late 2007, the magazine Auto Express, after continued rumours that Triumph be revived with BMW ownership, featured a story showing an image of what a new version of the TR4 might look like. BMW has not commented officially on this. Saab 99 used Triumph engines when the supply of German Ford V-4s ended. Lotus Seven (1960–68) the Series 2 had many Standard Triumph parts. Daimler SP250 used various Triumph parts in its gearbox and suspension, gearbox was a copy of a Triumph unit. Jensen-Healey Mk. I used TR-6 front brakes. MG Midget 1500 (1975–79) Rubber-bumpered Midgets used the 1493cc L-4 and gearbox borrowed from the Triumph Spitfire. Pre-war Triumphs carried a stylised Globe badge, usually on the radiator grille, and this was also used on the first three models produced under Standard's control. Standard had introduced a new badge in 1947 for their own models, first seen on the Vanguard, a highly stylised motif based on the wings of a Griffin. With the introduction of the TR2, a version of this badge appeared for the first time on the bonnet of a production Triumph, while the Globe continued to appear on the hubcaps. This same double-badging also appeared on the TR3 and TR4, the 2000 and the 1300. However, the original Herald, Spitfire, Vitesse and GT6 models all carried only the Griffin badge on their bonnets/radiator grilles, with unadorned hubcaps. The TR4A appeared with a Globe badge on the bonnet, apparently signifying a return to the original Triumph badging. This was short-lived, as a policy of Leylandisation mean that neither Globe nor Griffin appeared on subsequent models from the TR5 onwards, or on later versions of the Spitfire, GT6 and 2000. Leyland's corporate badge, a design based on the spokes of a wheel, appeared on the hubcaps of the 1500FWD, and next to the Triumph name on the metal identification labels fitted to the bootlids of various models. It was also used for the oil filler cap on the Dolomite Sprint engine. However it was never used as a bonnet badge, with models of that era such as the TR6 and the second generation 2000 carrying a badge simply stating the name "Triumph". The Stag model carried a unique grille badge showing a highly stylised stag. The last versions of the TR7 and Dolomite ranges received an all-new badge with the word Triumph surrounded by laurel wreaths, and this was also used for the Acclaim. It was carried on the bonnet and the steering wheel boss. 1 2 3 Robson, Graham (1972). The Story of Triumph Sports Cars. MRP. ISBN 0-900549-23-8. ↑ "Alfa Romeo 8C 2300". rickcarey.com. Retrieved 16 August 2007. ↑ Robson, Graham (1982). 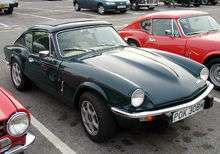 Triumph Spitfire and GT6. London: Osprey Publishing Ltd. p. 8. ISBN 0-85045-452-2. ↑ "Goodbye Standard long live Triumph". Motor. 15 May 1976. pp. 39–40. 1 2 Marren, Brian. "Closure of the Triumph TR7 Factory in Speke, Merseyside, 1978: 'The Shape of Thingsto Come'?". Academia.edu]. Retrieved 29 August 2013. 1 2 3 4 5 6 Robson, Graham (1982). 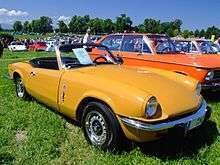 Triumph Spitfire and GT6. Osprey Publishing. p. 187. ISBN 0-85045-452-2. ↑ "The Unofficial Austin-Rover Web Resource". ↑ Long, Brian (2008). 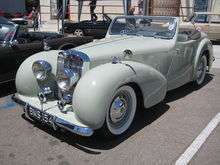 Daimler V8 S.P. 250 (2nd ed.). Veloce Publishing. p. 168. ISBN 1-9047-8877-7. Clearly based on a Triumph unit, the SP's manual gearbox is rather weak for such a powerful engine. First gear has a tendency to strip if misused by the driver, but most gearbox parts are replaceable with Triumph components. ↑ Robson, Graham; Bonds, Ray (2002). "Daimler SP250 ('Dart')". The Illustrated Directory of Sports Cars. MBI Publishing. p. 129. ISBN 0-7603-1418-7. The new car, which Daimler wanted to call the 'Dart' until Dodge complained that it held the trade mark rights to that name, had a chassis and suspension layout which was unashamedly and admittedly copied from that of the Triumph TR3A (both cars were built in Coventry, England), as was the gearbox. Wikimedia Commons has media related to Triumph vehicles.